Further limited versions will follow in 2019. Just in time for Christmas we are able to offer our first CMC Jaguar, the C-Type from 1952. The model painted on glossy deep British Racing Green fits perfectly under any Christmas tree. But not only our CMC Jaguar novelty was a beautiful gift for every petrolhead – or simply for people who appreciate outstanding quality in their life – Each CMC replica is an individual work of art, precisely and authentically built by hand and assembled from well over a thousand individual parts. Each vehicle has its own unique history. Take some time and be inspired by our linked descriptions of the individual model variants. We can promise a delivery in time before Christmas. The Jaguar C-Type has a proud racing history and from today’s point of view is the beginning of Jaguar Cars Ltd’s impressive motorsport program. The XKC was born out of the idea of William Lyons – not a “sir”at this time yet and his Chief developer William Heynes in the late summer of 1950. The two wanted to give the sporting image of the brand a lasting boost and demonstrate the result to the international audience and potential buyers in the following year in Le Mans. Quod erat demonstrandum! 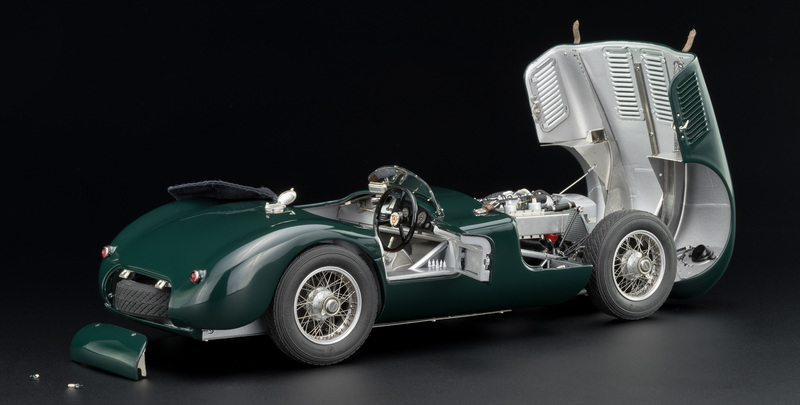 While the drive of the brand new C-Type built on the proven engine of the XK120, its robust, but weighty chassis has been replaced by a very lightweight tubular frame. With the link below you can watch some photos out of the production of the CMC Jaguar C-Type in our factory. By clicking an image you will be led to the according product site with all imformation about the chosen model. What was the idea of the two Williams – Heynes and Lyons, the two Jaguar officials? Who decided in late summer 1950 to take part in a race that would happen only a few months later at the Sarthe in France? When the factory team appeared for training at the circuit of Le Mans in 1951, the cars were still untested. Were Heynes and Lyons really thinking of winning? An impressive answer was given with the victories of the C-Type at the Sarthe in 1951 and 1953. At the 1948 London Motor Show Jaguar unveiled the brand new XK 120 in a limited version for motor sport use. The visitors of the fair were fascinated by the shape of the XK 120 and its technology and had higher demands than the Jaguar managers had hoped for. So Lyons decided to step up the development of the XK 120 into a road vehicle and offer it worldwide. Sales forecasts in North America were very promising. In 1950, the XK 120’s level of development was more or less the same as it was in 1948, and the car did extremely well in the Le Mans race, so Heynes and Lyons had joined forces to get Jaguar winning the big bowl the year after. The long-distance classic was Jaguar’s main target and the management was aware of the multiplying effects for the brand in case of a success at Le Mans. Accordingly, Jaguar relied on high reliability, the smooth handling characteristics and very balanced aerodynamics. Chief engineer Heynes did an excellent job. The XK 120 engine performance was increased to 210 hp with the help of larger SU- carburettors. 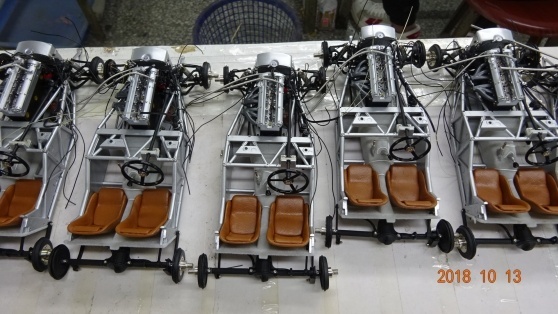 The chassis was redesigned as a tubular frame. In addition, Jaguar introduced a lighter alloy sheet metal body with only one door for the driver. This design was the contribution of Malcolm Sayer, a gifted engineer who gained his experience through years of work for the English RAF (Royal Air Force). The cockpit was protected only by a tiny racing windshield. Also the space inside was very limited. Nevertheless drivers like Moss, Walker or Whitehead found all necessary instruments and even spare spark plugs and tools for repairs during the race in the C-Type cockpit. The new car was tested in the hinterland near the Jaguar location in Coventry. There were a few things that could be improved. Then they set off for France with their drivers. Jaguar came, drove and won. The lead on the following car was 9 laps. The drivers also set a new long-distance record. After the success in Le Mans 1951 followed further victories, including Goodwood, Reims, Torrey Pines, and of course the new victory in Le Mans 1953. But the 1952 appearance of the Jaguar works cars at the Sarthe 1952 went all wrong with all 3 C-Types suffering engine overheating and finally retiring from the race. It was rumored that Stirling Moss thought that the new Mercedes SL were stronger than they eventually were in the race. The failure of the Jaguar fleet made the 1952 Mercedes victory no less valuable but probably a bit easier. The next – well prepared – attempt came 1953, the year after. The Jaguar team had started with more powerful engines with a new mixture preparation provided by three Weber dual carburetors and Dunlop disc brakes in the altogether improved Type C. It was an exhausting race, but the Cunninghams, Ferraris, Lancias, Maseratis and Alfas soon realized that no herb had grown against the strength of the Type C. Even the Ferraris were not up to the speed of the Jaguar in the long run and failed with overstrained engines, respectively had to line up behind the big cats. Surprisingly enough, two Cunningshams were among the first ten cars at the finish, but only one Ferrari. In the end after the chequered flag fell, game was set and match was won for the Jaguar factory team: Among the first 10 cars to pass the finish flag on 27 June 1953 were four Jaguar Type Cs: they reached 1st, 2nd, 4th and 9th place. William Lyons dedicated this triumphant triumph to Queen Elisabeth, who had just been crowned. Her Majesty responded in her own way and knighted the Jaguar chief in the spring of 1956. In his wildest dreams, every collector hopes to be able to pull a car out of a barn one day, rusty, dusty, but of a significance that would astound the experts. That’s exactly what happened in the fall of 1997, when Terry Larson, a well-known Jaguar expert from Mesa, Arizona, pulled a lost Jaguar C-Type in Oroville, Northern California, out of a dilapidated woodshed and into the daylight. The world of Jaguar enthusiasts listened: a lost son had returned. The Jaguar XK 120 C, with chassis no. XKC 023, short C-Type no. 23 (where C stands for Competiton), has led a pretty eventful life. Once the car could be found on the race tracks of the American west coast on all important occasions – often with well-known people from the film and car scene at that time as pilots – it lost its track at the end of the sixties in the twilight of history. XKC 023 was delivered to California’s main agent, Charles Hornburg, on November 28, 1952 and sold by him to Seattle’s Jaguar dealer, Joe Henderson. 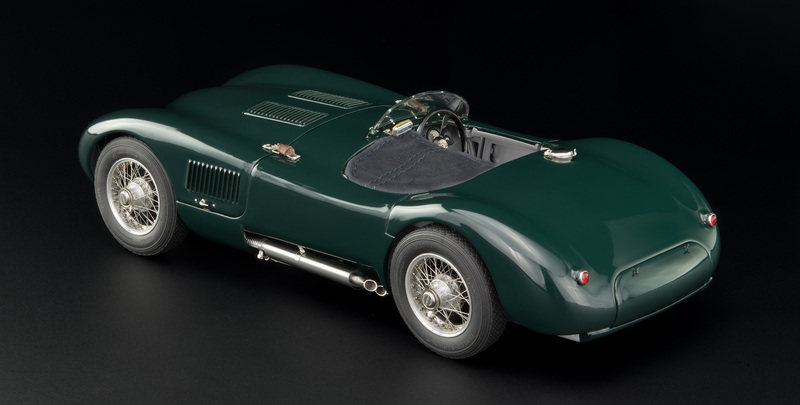 Half a year later, in August 1953, the C-Type participated for the first time in a noteworthy race, the Seattle Seafair 100 miles. The drivers were Bill Pollack and Jack Douglas, Hollywood comedy writer and television producer. Douglas, 1908 – 1989, was best known for his comedies written for the big names in Hollywood and his close relationship to Mizzi Gaynor, 1930 -, actress (South Pacific, 1958) and as the occasional dance partner of Gene Kelly (Les Girls, 1957). Was it the pleasure about that second overall place or that he wanted to make a name for himself in other sports car races, he bought the C-Type and thus took part in a whole series of races in the west of the USA. Christian Jenny kept a lot of documents from that time. Reports in car magazines, excerpts from narrow films, pictures with Jack Douglas: Jack Douglas at the start, Jack Douglas in the race, and above all, Jack Douglas with Mitzi Gaynor. Always present: the striking Carmen Red color, in which the car already shone when it was delivered. In 1955 at the race of Torrey Pines, a car and golf mecca on the Pacific in southern California, Douglas rolled the car over some hay bales of the barrier. One of the witnesses was Tom Groskritz driving the XKC 033. After the first lap he saw the XKC 023 upside down in the first corner. Jack walked up and down, he was not hurt. On the other hand, there was significant material damage to the body of his car. But nothing should prevent the daredevil, which he obviously was, from participating in further sports car races. But while the dented aluminum was still being repaired, he bought a D-Type and the C stood alone in a corner of his garage. This led his race mechanic, César (Ces) Critchlow, Huntington Beach, CA, to put 2000 green notes on the table (he had to sell his XK 120 M for $1500) and became the proud owner of a C-Type. Ces was not only a gifted technician but was also considered a young, but successful and talented pilot already for some years with MGs and XKs. Right in the first race (Santa Barbara) he defeated his mentor, Douglas, in the D-Type. In order to be able to face the meanwhile strongly grown competition more advantageously he had the S.U. carburettors replaced with a Hillborn Constant-Flow injection system, which was still in its infancy at that time. This required the replacement of the original cylinder head with one of the XK140 – which provided larger valve openings. Whether the injection had produced the hoped for increase in performance remains unseen. It is however reported, that this equipment pitched the idle speed up to around 3000 rpm, which could hardly facilitate practical use outside a race track. Interestingly, the discarded original cylinder head found its way into a motorboat in order to allegedly spur on the XK engine installed there (see also section “XKC023 remains active, is honoured and is finally complete again”). On November 18, 1956, Critchlow took part in the Paramount Ranch race, and overturned the car for the second time. Gasoline began to leak. He was lucky: still lying under the car he politely asked a puffing track marshal to extinguish his cigar and also to become the “official cigarette-putter-outer” for all the arriving smoking gaffers. He then asked to lift up the car lying on top of him. Somewhat dazed, but unharmed, he crawled out. The Jaguar was gradually pushed into the role of an aging star with a big pedigree. Once again, the tubular frame and mechanics had remained undamaged, but the outer skin was so damaged that a repair was considered impossible. This may have led Critchlow in the following year to the decision to mount a Devin fiberglass body on the still perfect substructure. Based on Italian Scaglietti sports car bodies, Bill Devin’s plastic bodies, available in various sizes, were already quite popular at the time. Around this time Ces began to work for Horvath Motors, a small sports car dealer in Costa Mesa that no longer exists today. The new body of the car was fairly finished, but one could hardly hope for further racing successes. Perhaps Ces drove one or two more races with the Jaguar-Devin, it is not handed down. Then it became quiet around the once proud racing car. It disappeared under a dusty tarpaulin. Critchlow had been drafted into the military for two long years. After his return he had lost his lust for the Jaguar. A new obsession, a Lotus IX with Buick V8 engine, crept over him. All it needed now was a Jeep with a Chevy engine. Critchlow traded the Jaguar Devin for his new toy. Thus Horvath himself had become the owner. Hardly done, there was a further trade, which lets us marvel from today’s view likewise. In 1961 Horvath Motors needed a new storefront for its building, but did not want to pay cash for it. An agreement was reached with a painter’s shop to exchange the C-Type for a new coat of paint on the building. One year later, exactly this painter’s shop urgently needed an engine overhaul for his aging Ford pick-up truck. This work was also compensated by means of an exchange deal. Frank Schierenbeck accepted the C-Type as payment for the work on the Ford-V8 of the painter’s pick-up. He even paid up a little cash. Thus he became the owner of XKC 023 in 1962 and was to remain so until 1997. Frank L. Schierenbeck is a man with an impressive background. Coming from an old Prussian officer family, the family emigrated to the USA around the turn of the century. After his apprenticeship he participated as an officer in the Korean War (in the staff of General Mc.Arthur), then in the 50’s built up a small, but well reputed shop, “Car Service Imported” at the Harbour Boulevard in Costa Mesa (near Disneyland, in the south of Los Angeles). For many enthusiasts at that time, among them Briggs Cunningham and Lou Brero, he was considered Mr. Jaguar par excellence. He is still remembered by many today. Schierenbeck replaced the Hillborn injection with original S.U. H8 carburetors and then drove the C-Type as his everyday car. As a gifted engineer he managed to get the XKC 023 to reach the speed of 165 MPH ((267 km/h), measured with precision instruments) on his “personal test site”, which he shared with Briggs Cunningham, the Orange County Airport (today John Wayne Airport) . He registered the car at the California Motor Vehicle Department. No other C-Type had been registered in the hands of the same owner for such a long time. Never before a C-Type was kept in one hand. In spring 1974 Schierenbeck left Southern California and moved to Idaho and from there on to Alaska. The car was parked at his parents site in Berkeley, CA, along with other XKs who remained in his possession. In Alaska, he heard from his mother that his nephew would sometimes take the wheel and drive around the area. “Making the area unsafe” would have been the better word for Frank – as he says today. He knew what his driving style was and now he heard that he would even take part in SCCA track races. He feared for the nephew’s life and forbade further use without further ado. The nephew was angry and disassembled the car into its components. So the C-Type remained in crates until Schierenbeck returned from Alaska in 1981 and settled on a ranch near Oroville in northern California. He took all his XKs and the boxes of C-parts with him and stored them in a whole series of sheds and wooden crates that he had built up there himself. That wasn’t just carelessness or comfort. Frank was an extremely thoughtful person. In the military he had had a lot to do with secrecy and espionage. He concluded that XK parts, distributed in different places, were far more regarded as “junk heaps”, and thus as scrap metal and not as real value. Nobody notices a C-Type dissolved into individual parts, scattered between XK parts, except a pronounced expert and enthusiast for exactly this type of car. And he kept away from such experts in his seclusion. Sometime in the late sixties the XKC 023 fell into oblivion. At that time there was no great interest in old sports cars, especially when one of them wore a plastic dress that was not particularly attractive as a camouflage cap. 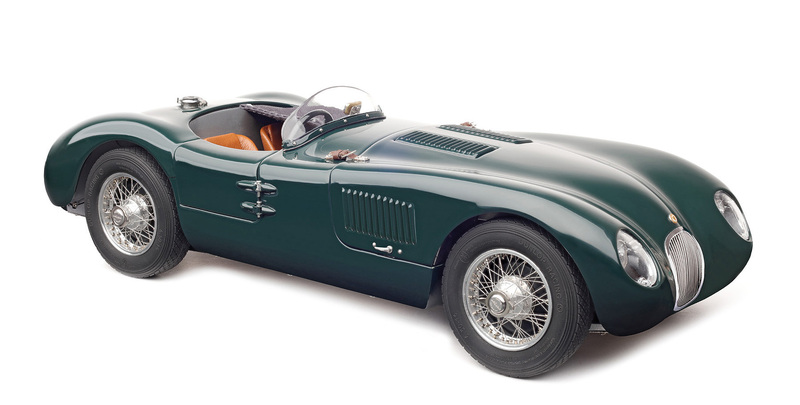 Last but not least, it was the only of the 53 C-types manufactured by Jaguar whose whereabouts were unknown. For all the others, some targeted research was enough to find out who owned it and where it was – or at most, what final fate might have reached it. But this one remained lost. Although rumors wanted him hidden somewhere, nobody knew more. It may have been around 1986, when Terry Larson became aware of Frank Schierenbeck through his longtime friend and outstanding C- and D-Type expert, Tom Groskritz, Huntington Beach, California. Do you remember? Groskritz knew the car since Torrey Pines in 1955, and he knew Frank since the end of the 1950s. On the first call Schierenbeck seemed quite cool, rather a bit annoyed; then, over the years more and more friendly. It remained however nice words without any promises. Meanwhile back from Alaska for a while, Frank hadn’t yet made any effort to put the C-Type back together again and get it on its wheels. But he didn’t want to sell either. On the telephone there was little concrete; it seemed as if original parts were available, but not how many and which ones could not be deciphered. Not even whether the chassis (the tubular lattice frame) was genuine or just a replacement frame supplied by Jaguar. In addition, Frank was about to divorce his wife. There it was not opportune to draw attention to valuable things like a C-Type. This was left to rest until everything was over and the lawyers had thrown themselves at other opportunities. As time went by, he gradually became more talkative, finally willing to talk about a possible sale. But it took time. Terry had already been asked at the beginning of the 90s by his friend Christian J. Jenny about the possibility of obtaining such a car and then having it restored. He spoke of a C-Type, which might be available, but what this means in detail, he could not say in view of the unclear information. Only one thing he knew: all attempts to push things forward would have led to an immediate break in relations. It was and remained appropriate, to approach the matter gently, patience seemed to be the best way to reach the goal. And in this he practiced himself, just like his friend who was willing to buy. Finally, at the end of October 1997, after more than ten years, the time had come. Schierenbeck’s ex-wife remarried. Rarely has a wedding been so eagerly awaited by two outsiders. This meant that, according to US legal practice, no further demands could be made on Schierenbeck. Above all, however, there was the all-important chassis number. Terry quickly spotted the original punched identification XKC023 on the front crossmember, one of two places where the chassis number had to be found. The other number he could not recognize, because for the admission of the new body in different places mounting plates had been welded on the frame. In addition, all parts of the original body were missing. Sure, there was the Devin plastic skin and it was loaded, like all other parts, onto the trailer, but not a trace of the original aluminum parts. Terry Larson brought everything together in his small but nice shop in the middle of the Saguaro cacti of Mesa, a suburb above the rapidly spreading metropolis Phoenix. The first thing he wanted to see was what would come out under the welded flaps. Gently, gently the flaps were warmed up at the expected place and then bent over and pulled away. For 40 years no one had seen what was now slowly coming to light. Carefully everything was recorded on film. And then the letters and the numbers came out. With two it was clear, with the next three it was safe: The find was authentic. No doubt about it, it was the original Jaguar C-Type tubular frame. The search for the lost body parts began at the same time as the reconstruction. And Larson found them. Four decades before, they had not been carelessly thrown away, but rather had been stuck at Horvath Motors and found their way onto the chassis of a replica after many years. And this replica had then been considered “real” under the same chassis number “XKC 023”. Now, when it became public that the real car had appeared, the owner agreed to sell it. Terry and his friend Christian took their chance. All those parts that came from the original were dismantled and replaced by replicas. The wrongly stamped numbers were deleted (“false numbers obliterated”) and the replica was resold. It should also be added that the frame of this car was once originally manufactured by Jaguar and delivered to the USA as a spare part in the 1950s. Accordingly, this car can be seen as a special type of replica built on an authentic but unnumbered chassis. All XKC 023 parts were then flown from Arizona to Coventry to R.S. Panels. There – so to speak at the place of birth – the car was rebuilt. Back to Mesa the actual restoration started. All parts were cleaned and tested. Engine block, cylinder head, carburetor, gearbox and all other mechanical components were meticulously refurbished. Everything again took the form of the C-type which had left the Jaguar halls at Holbrook Lane, Coventry, in 1952. Again painted in the original Carmen Red, XKC 023 drove after 26 years in November 2000 again at the “C- and D-Type Tour” in northern Arizona. “Checked and Passed” wrote Norman Dewis in the end of the ride in the (single!) door of the C-Type – 48 years earlier his assistant had written the same to Bill Heyns. The circle had closed. XKC023 remains active, is honored and is finally complete again. In 2001 Christian J. Jenny drove the Mille Miglia together with Peter Werdenberg. In spring 2003 the XKC023 took part in the Concorso d’Eleganza Villa d’Este. Later, in May 2003, Jenny and thirteen other Jaguar C-Types undertook a multi-day trip from Coventry to Le Mans to celebrate the success achieved there in 1953 at the 24-hour race with an almost triple victory (1st, 2nd and 4th place). The caravan of C-Types drove the demanding route in a loose column with a wonderful overnight stay in the Normandy. To celebrate, the participants were allowed to drive two laps on the Circuit de la Sarthe shortly before the 24-hour race. On May 19, 2006, the owner of the Jaguar C-Type with chassis number (VIN) XKC 023, Christian J. Jenny, received the second newly created FIA Heritage Certificate (FIA HC) in Monaco. The FIA HC was signed by Max Mosley, President of the FIA, and Johannes Hübner, President of the FIA Heritage Committee. The last part of the circle to be shut took place on April 27, 2007: Christian Jenny buys the C-Type replica at the auction of the Ponder Collection, Texas, USA, the “Recreation” which carried the cylinder head E1023-8 removed from Critchlow in 1956; today the original cylinder head is reunited with XKC023. CMC Jaguar C-Type,1954 (blue) Ecurie Ecosse #19 Jimmy Stewart, Limited Edition 1,500 pcs. CMC Jaguar C-Type, (red) actual condition, Christian Jenny, Limited Edition 1,000 pcs. CMC Jaguar C-Type, 1953 (yellow) 24H France, Jaguar racing team, #20 Roger Laurent / Charles de Tornaco, Limited Edition 1,000 pcs. CMC Jaguar C-Type,1953, (British Racing Green) 24H France WINNER #18 Tony Rolt / Duncan Hamilton, Jaguar racing team, Limited Edition 1,500 pcs. CMC Jaguar C-Type, 1953/54, Panamericana #13 Fancisco Ibarra / Fernando Pinal, Limited Edition 500 pcs.